22 m a s s a g e & b o d y w o r k m a y / j u n e 2 0 1 6 best practices BUSINESS SIDE What's Your Profit Margin? How much do you really make per session? By Les Sweeney, BCTMB, and Kristin Coverly, LMT A regular topic of conversation in our field is income, with comments coming from those who are employed by others and those who are independents. Many times, hourly pay is used as a means of comparison when considering jobs (or attacking employers). The US Department of Labor's Bureau of Labor Statistics provides an estimate on pay, but it doesn't account for independent professionals. Associated Bodywork & Massage Professionals (ABMP) shares member survey data about therapist income. There are lots of numbers bandied about. But do you know how much money you make per hour, per session, per month, per year? 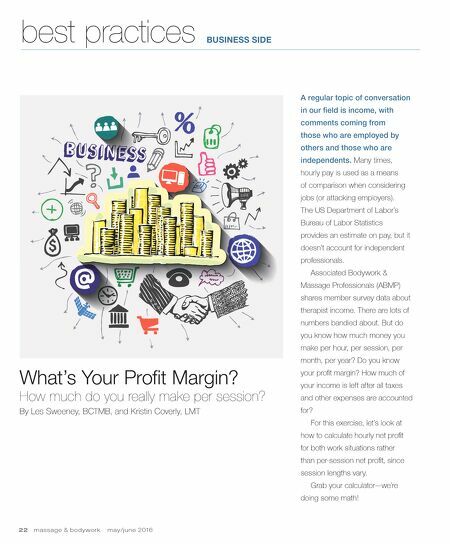 Do you know your profit margin? How much of your income is left after all taxes and other expenses are accounted for? 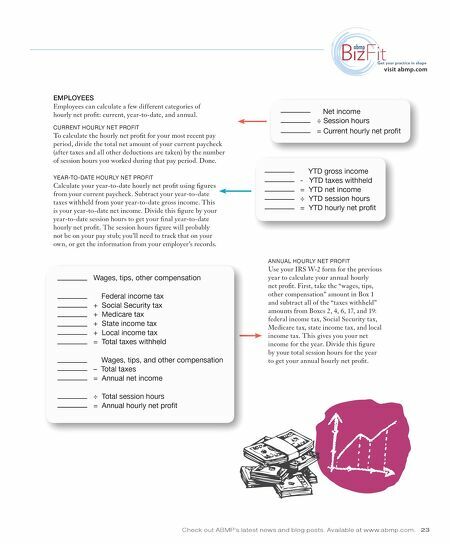 For this exercise, let's look at how to calculate hourly net profit for both work situations rather than per-session net profit, since session lengths vary. Grab your calculator—we're doing some math! Tell Me: Do You Prefer to Work with Certain Clients?